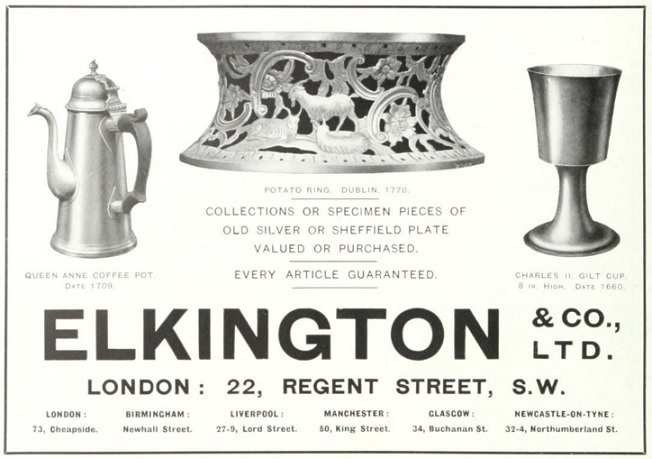 Messrs. Elkington and Company Ltd., Newhall Street, Birmingham, are present with a magnificent show-case, artistically designed and finished, filled with a collection of their silver and electroplate, the art work being a prominent feature. The King of Italy has conferred the distinction of the Royal appointment on Messrs. Elkington & Co., Ltd., goldsmiths, silversmiths, and jewellers. 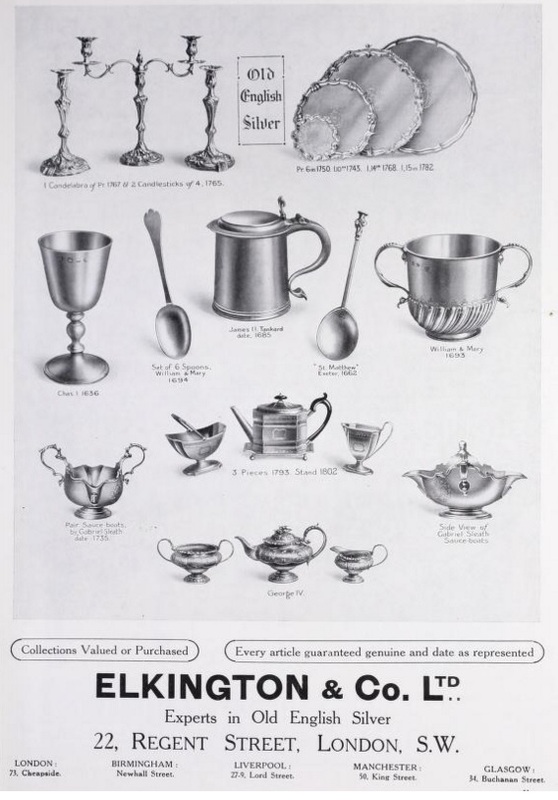 The jurors at the Franco-British Exhibition have awarded Elkington and Co., Ltd., the Grand Prix (the highest attainable award) for silverware, enamelling, and Elkington plate, also two diplomas of honour and two gold medals. They therefore have obtained the greatest number of awards in their section and the highest distinctions the jury could bestow. The Right Hon. W. E. Gladstone opened a fine art exhibition at Chester, on the 11th ult., in aid of the funds of the local School of Art. In the course of his remarks the right hon. gentleman said:—"I do not think that in the art of designing for silver plate we have made the same advances as we have made in designing for glass and porcelain, but the beautiful works that Messrs. Elkington have sent to this exhibition (I know not whether there are others of the same kind) will show you that in that also improvement is at work. But do not suppose that because improvement is at work therefore there is no more to do. We want to carry this work of improvement to such a condition that it shall not depend upon the spirit or enterprise of this or that master, of this or that workshop or factory—we want to get it into the mind and brain and heart and feeling of the working men." 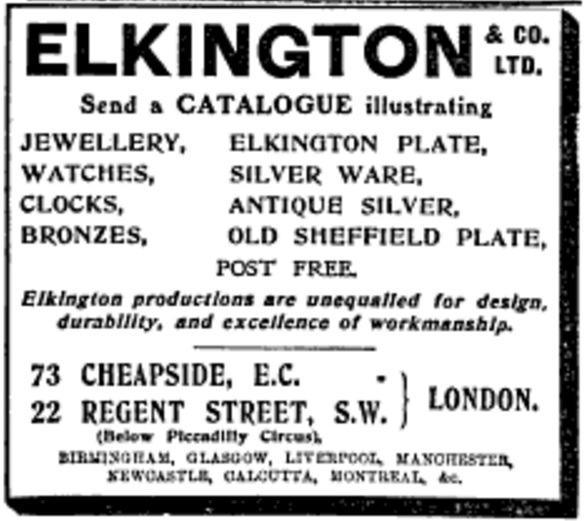 Messrs. Elkington & Co. Ltd. of London, Birmingham, Liverpool, Manchester, Newcastle, and Glasgow, jewellers, goldsmiths, silversmiths, and manufacturers of the famous Elkington Plate, have recently had the honour of being appointed purveyors to the Court of his Majesty the King of Spain. The Instructors in Jewelry Work at the Pratt Institute, Brooklyn, N. Y. 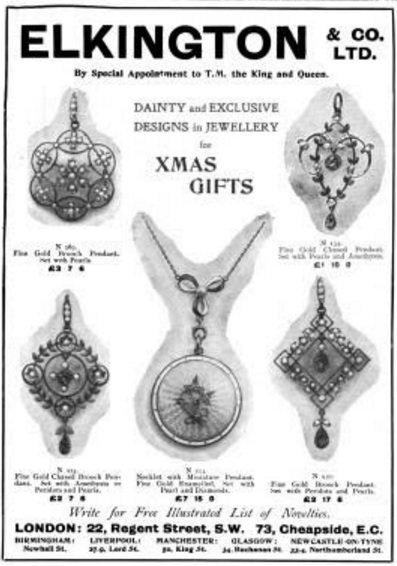 In an article published in the anniversary number of The Circular-Weekly the work in the classes in chasing, jewelry enameling, die cutting and medal making at Pratt Institute was described. For the success of the classes and the progress made by the pupils, as indicated in part by illustrations, which were given of notable examples of the handiwork, no little credit is due to the two competent instructors. 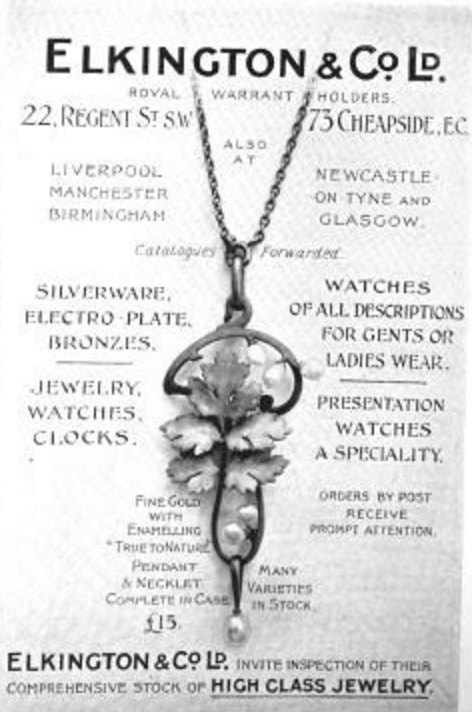 Mr. Hamann, who directs the work of the day metal classes and teaches design modeling, jewelry enameling, and hammered metal work, is an expert jeweler who was formerly connected with Durand & Co., Newark. N. J.. and more recently with Tiffany & Co., New York. In 1889 he went to Europe and studied modeling in Munich for one and one-half years, going thence to Paris, where he studied in the Academie Julian and the Ecole des Beaux-Arts for two years more. After his return to the United States he became the head modeler for the Whiting Mfg. Co., New York. He was the sculptor of the statue of Justice, which was one of the eight statues on the triumphal bridge at the Pan-American Exposition in Buffalo. At St. Louis he had a statue symbolical of Wyoming in the Colonnade of States, and he also originated the figure of Modern Arts on the permanent Fine Arts building. Julien Ramar, who is instructor in chasing and hammered work of day and evening classes, was engaged for several years as chaser for Elkington & Co., England. Since coming to this country he has been employed at the National Fine Art Foundry, by the Archer & Pancoast Co., J. & R. Lamb, the Edison Bronze Co., and by Edward F. Caldwell & Co., all of New York. He is at present employed as chaser by the Henry-Bonnard Bronze Co., New York. For several years Mr. Ramar was instructor of the art metal classes in the art school connected with the Metropolitan Museum of Art, New York. 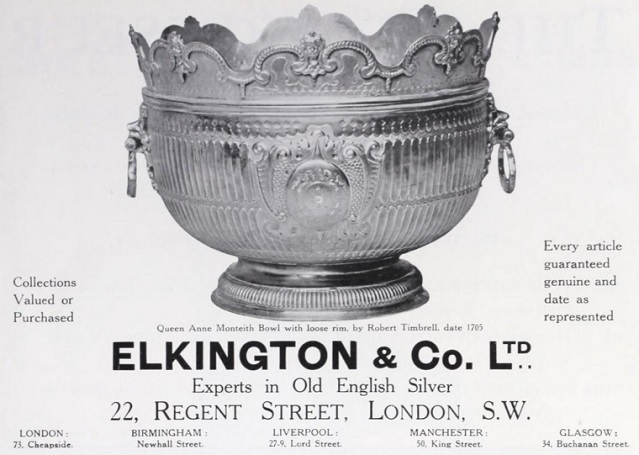 Messrs. Elkington & Co., of Newhall Street, Birmingham, are now at work on a silver mace which is to be presented by them to the city of Birmingham. The mace, although not yet finished, is in an advanced state of completion. It is about 3 feet 2 inches long, and when the various parts are joined together the whole will be richly fire-gilt. The upper part consists of a coronated cup, the crown terminating in orb and Maltese cross, and the circlet is ornamented with a sequence of Fleur de Lys and crosses. On the cover of the cup and underneath the crown are placed the Royal Arms. The cup is divided into four facets, bearing temporal symbols in high relief, repousé on a granulated ground. England is represented by the Rose, Scotland by the Thistle, Ireland by the Harp, and the municipality of Birmingham by its artisan-supported shield. Above each of the national devices is a crown. Leaves of oak divide the designs into their respective facets, and the base terminates in a five-shilling piece of the present year. The mace, which is designed by the Chevalier Willms, is a beautiful piece of ornamentation, and the whole design is artistic, and of the highest order. Messrs. Elkington are busily engaged on work in connection with the Jubilee. A casket is being made by them for presentation by the Manchester Corporation to the Queen, and five caskets are being made for the city of Warrington to celebrate the fiftieth anniversary of its incorporation, and also the Diamond Jubilee. An elaborate equestrian statue of the Queen has been executed by them, and a splendid vase, called the Three Queens Vase, descriptive of the deeds of Boadicea, Elizabeth and Victoria, has also been designed by the Chevalier Willms, and executed by Mr. Thomas Spall. An action has been brought in France by the representatives of Mr. Elkington, the proprietor of a patent for the new process of gilding by immersion in a bath of gold and alkali, against MM. Simon, Redier, and others, for piracy ; and a cross-action was brought by those parties, with a view of having it declared that Mr. Elkington's patent was null and void, on the ground of the process being public property. The case having come before the Cour Royale, on an appeal of one of the parties from the Tribunal of Commerce, a series of experiments was ordered; and, on Saturday last, the Court, after a full and detailed report of the operations, and ocular demonstration of the process, gave judgment in favour of the representatives of Mr. Elkington, by declaring that, although the gold and alkali bath, as used by that gentleman, had long been known as a chemical discovery, he was the first person who had applied it to the gilding of metals, and therefore his patent was good. M.M. Simon, Redier, and Co. were therefore declared to have no right to use the same process, and condemned to all the costs of the suit, which are said to amount to 40,000f. 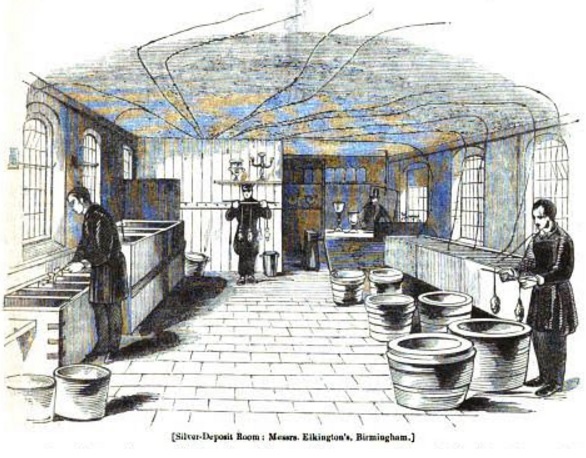 It is intimated that arrangements have been completed under which the business of Elkington and Co., electroplaters and silversmiths, of Birmingham and London, with all branches and agencies. has been converted into a Company, under the title of Elkington and Co., Limited. The shares are taken by the members of the firm of Elkington and Co., and it is no intended to make any allotment in favour of the public. The management of the business will be continued by some of the members of the late firm, who become Directors of the Company. 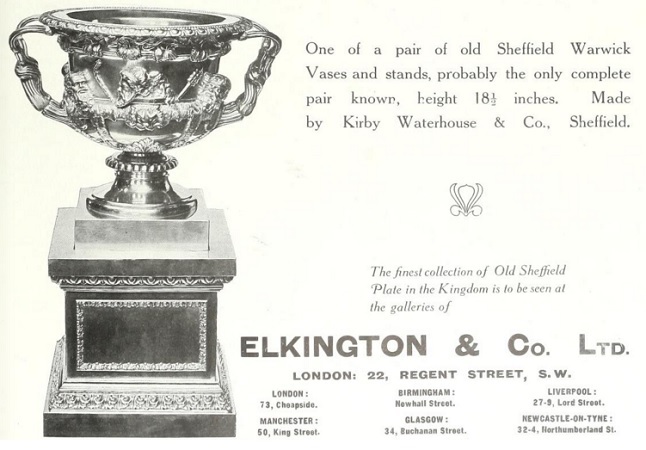 This Point-to-Point Challenge trophy was manufactured by Elkington & Co. in 1904. 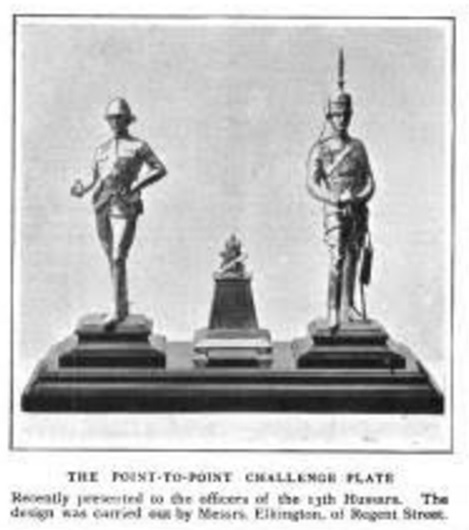 It was presented to the officers of the 13th Hussars by Captain F.W. Jarvis, late of the Loyal Suffolk Hussars and attached during the South African War 1899-1900-1901 to the 13th Hussars.